Groups of Saxons migrated across the North Sea throughout the second half of the fifth century, perhaps coming in successive waves. Moving westwards up the Thames along with groups which were already forming the Thames Valley Saxons, the Middle Saxons apparently detached themselves from this westwards movement when they reached British Londinium. They founded settlements to the west and north of the city (in modern Hertfordshire and the former county of Middlesex), threatening the Britons at Caer Mincip (St Albans) in the process. Londinium itself was largely abandoned for much of the sixth century while the Saxons settled villages in the countryside. Their fellow Saxons south of the Thames became known as the Suther-ge, or 'southern region' of the Middle Saxons. It seems that many of the early members of the Middel Seaxe came from Kent, having taken part in the successful conquest of that land from the British in 455-457. These probably would have been the foederati who had been stationed along the Saxon Shore, near to the forts, and also outside important cities such as Canterbury, before they joined Hengist's successful conquest of the territory. As the Middle Saxons, they are not known to have formed a definitive kingdom, but they were a recognisable group, as they gained their name from their location between two other, greater divisions of their people, the East and West Saxons. They may have been organised much the same as the Middle Angles, independent groups of closely related folks who perhaps formed a confederation. Those folk groups included the Geddingas, Gillingas, and the Mimmas of Yeading, Ealing, and Mimms respectively. One more, the Gumeningas, settled Gumeninga hearh (modern Harrow). The apparent similarity in many of the names - beginning with the letter 'g' - is probably coincidental. Ripping off the suffixes from Geddingas, Gillingas,, and Gumeningas leaves 'Ged', 'Gil', and 'Gumen', probably all men's names. Gumen may be a compound word used as a non-compound, perhaps either 'Gu' plus 'men' or, more likely, 'Gum' plus '-en' (a plural used by Saxons in the way the Angles used '-as'). The Mercians had the non-royal and very working class habit of using single names instead of the pretentious compound names that were often favoured by 'great kings' and their followers. It appears that the distinctly non-royal Middel-Seaxen also maintained the old custom of electing leaders rather than rubber-stamping kings from a royal family. Theoretically speaking, potentially dictatorial kings in the east (Kent and Essex) managed to annoy the common warriors sufficiently so that they settled further to the west to get away from them and, in revulsion, rejected the use of compound names. The historical county of Middlesex represented the southern limit of the franchises of St Alban's Abbey. While this may have formed the northern border of the Middel Seaxe, there was no natural obstacle to stop them venturing farther until they reached the foothills of the Chilterns. 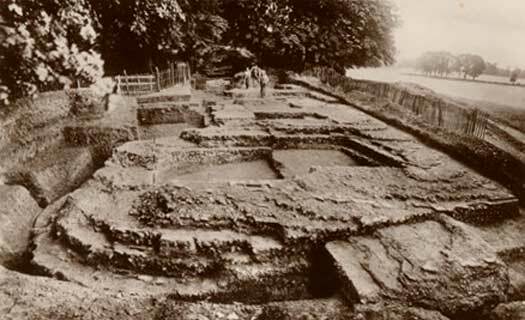 However, there seems to have been an enclave of Britons in the Chilterns (Cynwidion) who may well have fended them off from there and from Verulamium (the Roman city that lies adjacent to modern St Albans). The territory protected by this enclave may also be reflected in the territory which was later under the authority of St Alban's. Until the start of the seventh century, the Middel Seaxe appear to have remained under the influence of Kent. By AD 704, the region was mentioned in a charter as Middelseaxan, and by 1086 it was Midelsexe (in Domesday Book). Saxon settlers begin advancing along the Thames Valley, and some form settlements. Two large groups to the north, west and south of Londinium become known as the Middel Seaxe and the Suther-ge. At least some of these settlers appear to come from the newly-conquered kingdom of Kent, and remain under Kentish influence for the next century and-a-half. Around this date occurs the battle of Mons Badonicus, in which (as seems likely) it is Ælle, as Bretwalda, who attacks the Britons in the region of Caer Baddan. Ælle's route probably takes him through the Thames Valley and the Middel Seaxe to collect his forces from the large numbers of Saxons in the area, and then they head westwards along the upper Thames Valley until they emerge through the Goring Gap. The ensuing defeat halts Saxon advances for a generation. Interestingly, it seems possible that the British are still claiming an archbishopric of London. The writings of Geoffrey of Monmouth suggest that the title, which is likely to be in name only by this point, is freshly filled by the British Church in the middle of the sixth century. The Britons in the area of Biedcanford (possibly Bedford, near Luton) are defeated by Cuthwulf of the West Seaxe. Four towns along the Icknield Way to the north-west of the Middle Seaxe - Lygeanburg (Limbury), Ægelesburg (Aylesbury), Benesington (Benson), and Egonesham (Eynsham) - are captured. The valleys of the Thame and Cherwell are ruled by the West Seaxe, as is the upper valley of the Ouse. Cuthwulf dies in the same year. Caer Mincip (Roman Verulamium, modern St Albans) shows plenty of evidence for the survival of a British enclave here, in between the Middel Seaxe and the Icknield Way - possibly the last gasp of Trinovante independence. A late Roman building had been converted into a barn or granary by the application of huge buttressed foundations. Corn dryers were inserted inside the building so that such agricultural work could take place within the safety of the town walls. 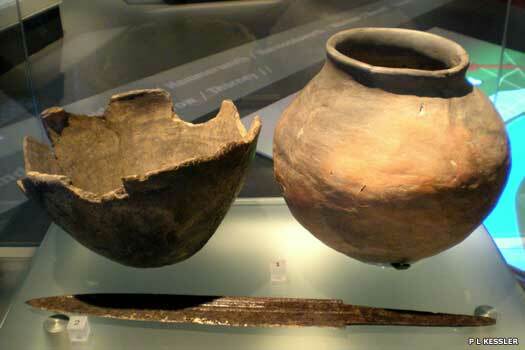 A wooden water pipe was later constructed across the site and maintained, quite possibly until the collapse of the enclave at the end of the sixth century. This date is very close to that of Cynwidion's collapse, and this territory lays to the immediate north. It seems likely that, in its final days, Caer Mincip is an outpost of Cynwidion, and perhaps a final survivor of the postulated Caer Lundein territory before that. That it has survived at all is probably due to the weakened state of all the southern Saxon kingdoms after their Mons Badonicus defeat around AD 496. The region comes under the dominance of the East Seaxe, who seem to treat it as a sub-kingdom, and Suth-rig as a further sub-kingdom. In the abandoned Roman city of Londinium, with a small Saxon settlement to the west known as Lundenwic ('wic' meaning 'trading post'), Mellitus lays the foundations for a cathedral dedicated to St Paul, his episcopal see as the first bishop of London. The crumbling walls probably still carry some of their paint, the gateways at Ludgate and Newgate are probably still largely intact, and the great amphitheatre on the hill near modern Guildhall, while containing a few breaches, probably still fills the sky, although the great east-west thoroughfares are doubtless choked with weeds and moss. The ruins provide the masonry and tiles for much of the construction work. The region comes under the dominance of Mercia, and the Middle Saxons now lose any independent identity onto which they may have held. They do retain an identity, though, which is reflected in the later creation of a shire that bears their name - Middlesex.